Posting for the VivaLasVegaStamps July challenge (steampunk it), SanDee and Amelie's Steampunk challenge (anything with steampunk goes) and the WOW embossingpowders July challenge (favourite embossing techniques). I made three ATCs using the VLVS moodboard and prompts (at least steampunk, copper, umbrellas, underwater, script). 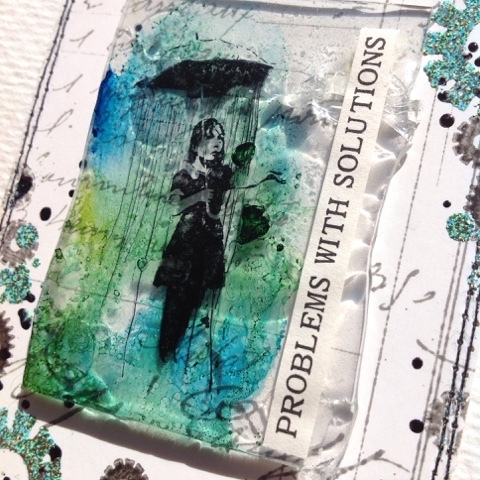 I love using embossing powders with stamps, it makes images pop out and gives texture to the piece. 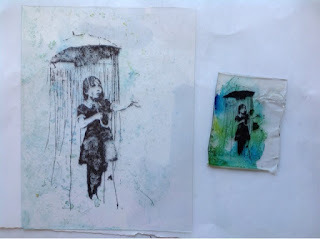 I also love embossed splatters, here I have both stamped splatters and splatters made with chunky embossing enamel. All stamps are from VivaLasVegaStamps. The lovely Banksy girl has been stamped onto transparent shrink plastic with black Stazon. I turned the plastic over and coloured the other side with blue and green alcohol inks. The tricky part was shrinking the pieces, they were A6 size (about american A2) and got into horrible curls. I did my best to open the shrunk piece and squished it with an acrylic block. I guess this size should be baked in the oven? The text is cut from a math book (luckily the index has this title over and over again!) and the background has been stamped with the Ledger background, small gears (some heat embossed with WOW Verdigris) splatters from the Coffee Ring stamp and some chunky black embossing powder. The plastic was attached with glue dots, they kind of look like bubbles behind the surface. The bends and wrinkles in the plastic ended up being quite cool, Here you can see how fantastic the piece looks with the sun reflecting itself around the insides of the plastic. The shrink plastic is awesome! Great cards! 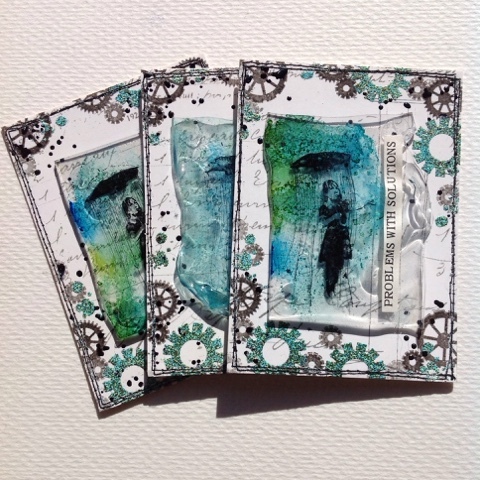 Such a beautiful set of ATCs, Kristina! I LOVE shrink foil and you have used it just brilliantly! Thank you for playing along with us at SanDee&amelie's Steampunk Challenges! I just love these so much!Thanks for entering the VLVS challenge...good luck! These are fantastic ! Thanks for playing along with the VLVS! challenge this month !